France's most famous wine-based brandy comes from the region of Cognac, with the town of Cognac at its heart. Ah, Cognac! My favorite after-dinner pousse-café. 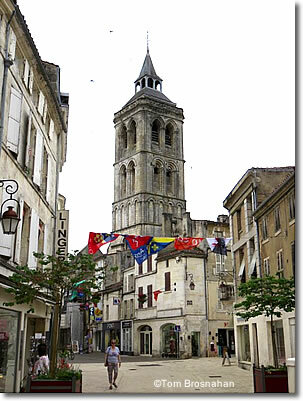 The town and district of Cognac, in the région of Poitou-Charentes on France's Atlantic coast, is the center of a swath of vineyard country where grapes are grown that make unpalatable wine which is then distilled into great brandy. Set on the Charente River between the cities of Angoulême and Saintes, Cognac is 483 km (300 miles) southwest of Paris and 128 km (80 miles) north of Bordeaux. 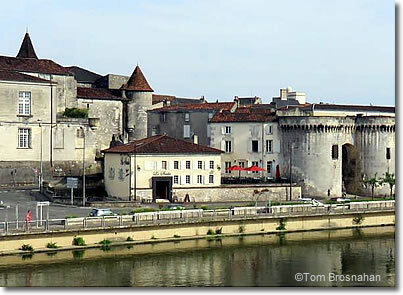 Surrounded by rolling hills covered in vineyards, Cognac is synonymous with its most renowned product. Some cognac distilleries are located right in the center of Cognac itself, others are nearby, or in neighboring towns, all still in the official cognac-growing district. Besides its world-famous brandy, the town of Cognac also has the honor of boasting that the great King François I (1494-1547) was born here. Although nice enough, with a historic château and churches, pretty parks and the verdant Charente River, the town of Cognac is not what attracts visitors. It's the chance to visit a cognac distillery, to learn how cognac is made, and to sample the products. You can do this on a visit of a few hours by train or car, or you can stay the night and enjoy the region more fully. is where France's great king François I was born. It's now the headquarters of Cognac Otard.